After packing up in Cincinnati, I made my way up to the Mitten for a week. 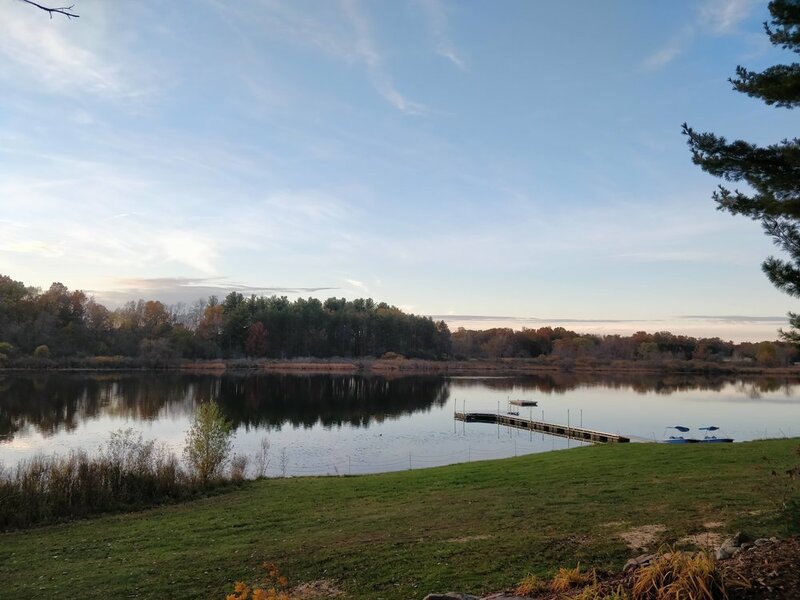 While the weather left a bit to be desired – cold, gray, and rainy – it was a nice chance to spend some time with friends, catch up on work, and have Mr. Scott Dedenbach give my equipment some much needed TLC. I was able to get in a few rides during the week too, but with cold, rainy weather on Thursday, I boarded the plane feeling a bit stressed about my lack of training. I left Detroit under dreary skies and arrived in Boston in the same fashion. Bags collected and van loaded, I headed south to the Cape for the weekend of racing. Boston traffic being what it is, I didn’t arrive to Falmouth until 7:30p and made some time to build bikes and relax a bit instead of hop on the trainer. The nerves were ratcheting up a bit more. The weather hadn’t changed much when I woke up on Saturday morning, but after taking some time to spin on the trainer in the morning, I was feeling a bit more prepared. 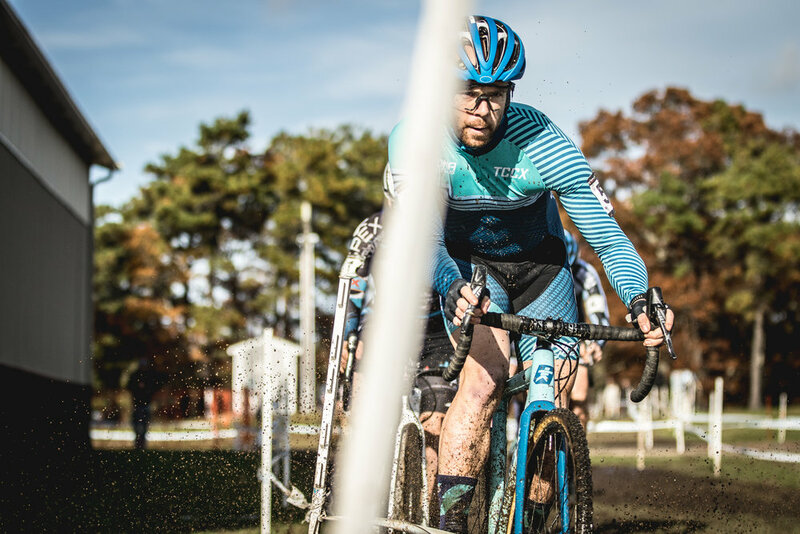 Held at the Cape Cod Fairgrounds, the track was mostly sandy and relatively flat with some punchy climbs. The steady rain made for slick conditions and a few puddles around the track. 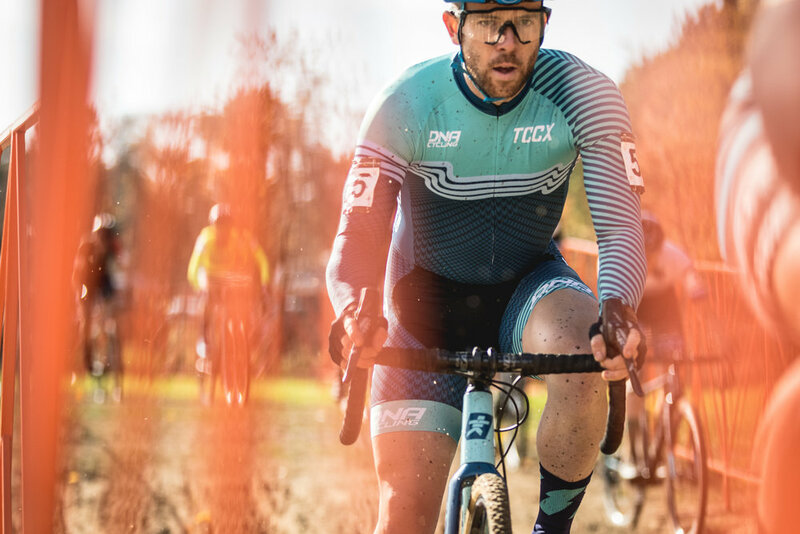 The course allowed for plenty of pedaling, but with a sandpit, a couple of tricky off-camber turns, and high winds, the winner would need to have a quiver of skills as well. With most of the top guys in Toronto for PanAms, I was able to get back on the front row (and not the last call up either) of the grid. I was a bit slow off the start, but I got into the pedals after a second and slotted into the draft in the middle of the peloton. Merv Davis (Cycle-Smart) took the holeshot, drifting all the way to the tape through the first corner. I think the whole peloton checked up a bit, waiting to see what would happen (or at least I did), but Merv held it together and carried on just off the front. After the first pass through the sandpit, we had a group of five off the front. No one really seemed keen to drive the pace a quarter of the way into the lap, but we would test each other a bit as we slipped and slid through the corners. As we made the turn for one of the slick off-cambers, I dismounted and ran the high line while a few of the other guys went low. Suddenly, I found myself on the front (!) of the bike race. Uh oh. A bit too far to the front, a bit too early, I took my lines through the ensuing turns but happily gave up my spot at the front to Justin Lindine (Hyperthreads/Apex Pro Cycling). 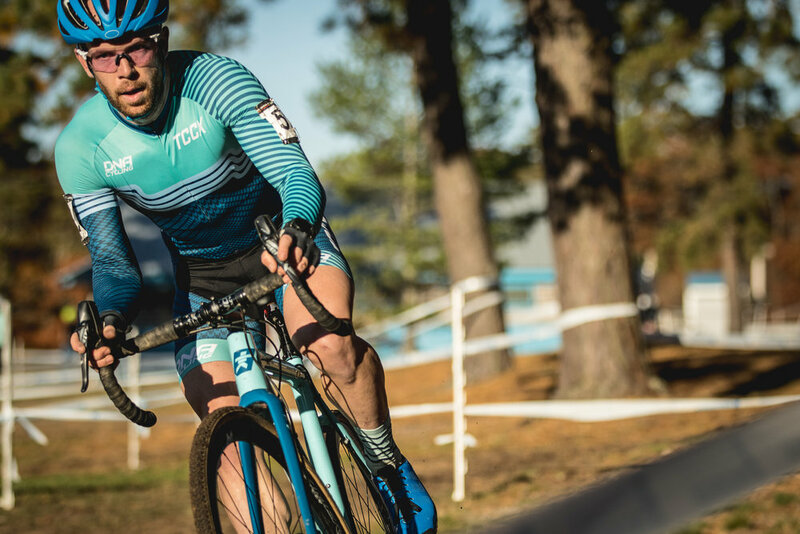 Justin hit the gas and stretched out the group a bit, keen to get the racing underway, as Kevin Bradford-Parish (SETcoaching p/b FSA), Scott Smith (The Dirt League), and Merv followed in tow. The race broke up over the next couple of laps and I found myself in a group with Merv, navigating the constantly changing course. Merv was riding well and I was constantly having to battle back to his wheel through the technical sections. As we made it through the first part of the lap, the wind kicked up and I caught, out of the corner of my eye, a piece of trash tumbling across the grass. In a split second, I hoped that it would miss my bike, but then there was the moment of impact. Somehow the waxed brown paper ended up stuck between the bottom pulley and the derailleur cage, which had pulled the derailleur itself over and caught a spoke. I let out a yell of frustration and hopped off to try and fix the problem. Losing places in the field, I picked my bike up and ran a 100m through the off-camber u-turn before setting the bike down again to remedy the situation. Wheel and derailleur free, I pedaled to the pit and ditched my A Bike, running across the pit to grab my B Bike (the joys of having no pit crew!). Back in the race, I was now back in about 15th place and toeing the line between perseverance and quitting. I pedaled on, picking up a few places, and then a spectator mentioned that I was in a group of 12th and 13th. Seeing the group of four in front, I knew that UCI points were just a few seconds in front. The carrot had re-appeared. We made the juncture with the group and I took a bit to chill, moving closer to the front in due time. We entered the tricky off camber, I went to the front and remounted to ride across the camber. As luck would have it, a strong gust of wind came up just as I dropped past the inside post. All of the sudden, snow fencing was in my shifter and I was going up and over the bars. I felt bad that I held up the guys behind me, and I gathered myself before getting back on the bike and pedaling back to the group. The remaining laps were a battle of attrition and I was able to create a gap eventually crossing the line in 9th place. I was a bit frustrated afterwards. I knew that I had the ability to ride in the top five but no one could have predicted such a freak incident as a random piece of trash. Needless to say, I was a much stronger opponent to littering as I drove back to my host house that evening. As my eyes cracked open on Sunday morning, they were met with slivers of sunlight peaking through the blinds. It was for sure a welcome sight and I was in a great mood as I made my customary pancakes while watching the European Cross Championships (aka the MvdP Show). Carbed up and smiling, my mood was boosted when I got to the track. 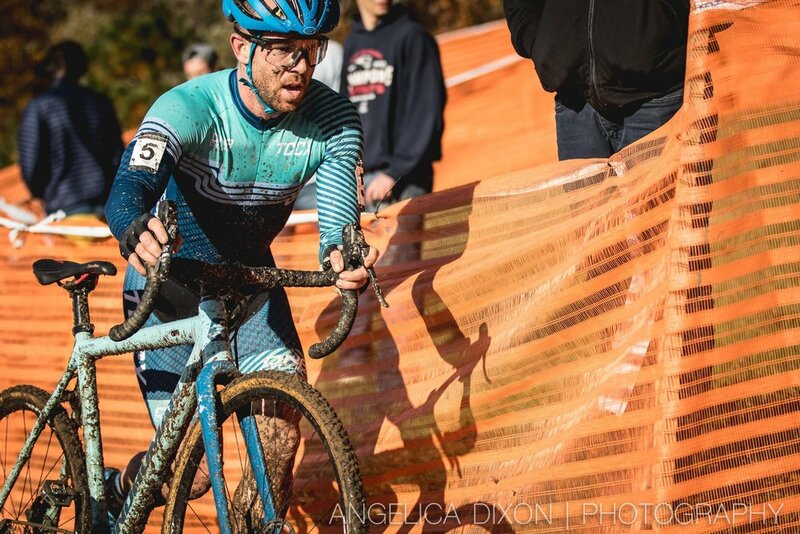 The rains and winds of Saturday had left behind “hero dirt” on Sunday. With a few minor changes, the course was similar in flow with a balanced palate of power and technical sections. After a few (dry) laps on course, I was feeling good and my spirits were high as I assumed my spot on the front row of the grid. My start was better today and I slotted into third wheel as we exited the pavement. After some jockeying for position in the opening meters, I slid back comfortably to fifth wheel (read as: Sven-th wheel). From my spot in line I could watch my opponents’ lines and analyze their approach to the course. What line are they taking in the sand? Where are they faster? In the turns? On the straight sections? Who is struggling with the pace? Who looks comfortable? All of these things rattling in my brain as I observed the lead pack. Noting my companions’ strengths and weaknesses, I shuffled up and back in the group accordingly, not stressing about losing a spot or two in the opening laps. In fact, I felt quite comfortable and confident that today was my day. Let me tell you, that’s an awesome feeling to have and one that empowers a rider to ride above their level. But sometimes, that feeling can be a false positive. Three laps down and another five to go, I was still sitting in my position at fifth wheel. Justin Lindine had already gone at the front and the bunch was starting to splinter a bit. Our chasing bunch was coming past pit two, hopping the lip on the pavement crossing to avoid flatting. I followed suit, just as I had done the laps before (and the day before at that), and as I landed, I felt the tension on the crankset dissipate. I didn’t have to look down as I already knew that my chain had bounced off the crankset. I pulled the brakes and came to a skidding stop just in front of the pits. Calmly, I bent over my bike (as is custom) and pulled the chain back on to it’s natural position on the bike. I looked back and there was no one behind me within reach. Putting my head down, I got to work and was able to take my lines with ease. I didn’t have to worry about giving up any secret lines as I started my chase, only moving forward as fast as I could. I felt like I was making progress in the chase and could see the group of third to fifth just in front of me by a handful of seconds. Coming past pit two, I repeated the routine that would save my tires and my wheels. And just as I had done the lap before, I came to a skidding stop to fix ANOTHER dropped chain. “Yep,” I said with a smile on my face, because what else can you do but laugh?! I remounted my bike and carried on, now back in 8th place. It took just a few turns for me to catch back to the duo that had passed me. There were about three laps left and I was eager to make up my places to chase down the top five, which had been in my grasp minutes before. As I chilled at the back of our trio for a second, I found myself grabbing a lot of brake to not run into anyone. I knew that I was going to go faster alone and decided to not relegate myself to riding in this group. As we exited the sand, the two riders swung left to set up for the righthand turn around a tree. I continued straight, and put in a few hard pedal strokes to get in front. I made the pass more than 10 meters before the tree, but my “aggressive” move was met with jeers and requests to announce when exactly I would be passing. I kept to myself and started my chase back to the front of the race. Even though I was pushing hard on the pedals, I was not able to shake my tail, and by the time we reached the second part of the lap, I was back to third wheel. Our trio approached the rideable stair section, and again I took a different line into a corner to try and get ahead. Accounts will vary, but I did my best to give enough room on the inside i.e. I didn’t shut the door on anyone. This time, one of the riders went down, and I sat up a bit so as not to be a complete jerk. We came back towards the start finish and I shuffled back in the group, asking each guy if they were okay. As you might be able to predict, the response was less than kind. First, if you’re passing someone(s) in a race, in pre-ride, or just on the road, please do it in a safe manner and one that does not cause you and/or the person(s) your passing to go slower than they would be alone. Unless you’re passing lapped riders, you do not need to announce which side you’re passing them on unless you’re being courteous. Why? If you announce which side you’re on, now your opponent can close the lane and you’re stuck behind them. I tried a few more times to makes moves off the front, but the fuel tank was starting to reach “E” and with one lap to go, I found myself on the back foot chasing 6th place. Try as I may, I didn’t have much left to make headway and crossed the line in 7th place. I’m constantly grappling with expectations. And even though I think there are expectations from friends, from family, from sponsors, from fans and spectators, these are all really just created internally. That is, their expectations are projections of the expectations I put on myself. After an awesome start to the season, I had high expectations for myself. 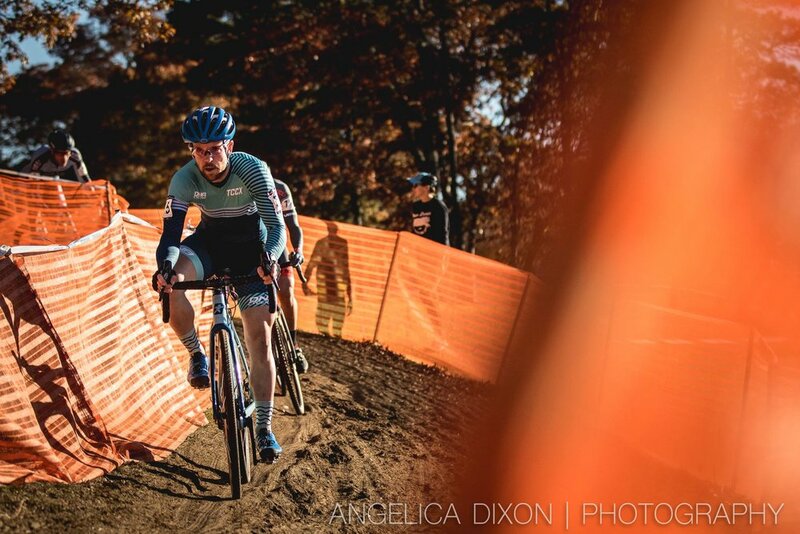 Mechanicals and crashes kept me from achieving those expectations in Cincinnati, and the same was true for this weekend in Massachusetts. Moreover, the most difficult part of being an athlete and chasing your goals is not the work or the sacrifices you make to stay on course. The most difficult part is doing all of those things and dealing with failure when you come up short, especially when the reasons for failure are out of your control. The weather was gray and rainy on Monday as I drove back to Boston. As I drove, I found myself getting frustrated with the most innocuous things… a driver going too slow, another forgets to use their turn signal, a traffic light takes too long to change, or a work email that is just “stupid”. Sure these things may be annoying, but they should not bring you to anger. And yet they were and I went through Monday and Tuesday in a pissed off mood, mad at everyone else and mad at myself. In reflecting on my behavior, I realized that my frustration could not be attributed to anyone or anything else other than myself. I had fallen short of the expectations I had for myself. I failed. Today I’m okay with that failure and I know that my results over the past two weekends are not a reflection of me as a rider. 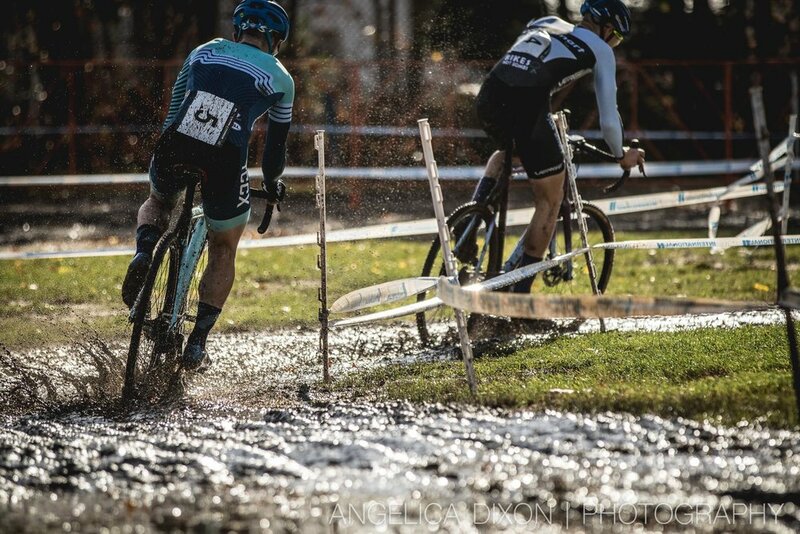 They are merely the trough in the set of waves that are the cyclocross season. The only thing I can do is learn from my mistakes (i.e. get my equipment dialed ahead of time) and keep putting in the work that has gotten me this far. Thank you so much to the promoters and volunteers for putting together such a wonderful event! And thank you to Matt & Ellen for hosting me in Falmouth and making me feel comfortable all weekend! Next up for me is a little bit of down time at home and some solid training before heading up to Indiana for the Major Taylor Cross Cup at Marian University. Let’s just hope there is no rain this year!